Lightning Powder 5-1100 Wide-Field Standing Magnifier FREE SHIPPING! This magnifier was rated second overall in an independent study by the Science & Practices Committee of the California State Division of the International Association of Identification. It was rated highest in field-of-view and viewing distance comfort. This glass resembles the German-made glass above, except that it is larger. The thumbscrew allows the lens housing to move up and down the shaft to focus perfectly for your eyes. The base, shaft and lens housing are metal. The view is clear and in focus across the entire distortion-free flat-field lens. A threaded crosshair reticle disc is available separately. Magnum PepperGel Spray 2.79 oz. Large PepperGel Spray 1.59 oz. 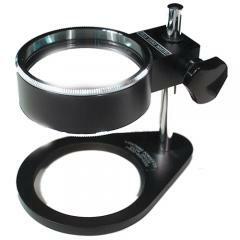 ©2002-2019 CopsPlus.com: Lightning Powder 5-1100 Wide-Field Standing Magnifier FREE SHIPPING!